I have loved Robbie Williams for as long as I can remember from his early days in Take That to his amazing solo career and back into the arms of his buddies in Take That. I love his songs and adore his personality, that cheeky chappy, very naughty boy next door. I think he always comes across well on television and his live shows are fantastic. He is a natural all round performer and a true show man, which is something I admire and like. I saw Robbie live at Roundhay Park for my 30th birthday. It was amazing, a great exhausting day and night with my wee sis. We had a great time bouncing to the Basement Jaxx and singing every word of the Robbie repertoire. One of the best days and nights of my life and one never to be forgotten. Made even more special as I shared with my little sister, Julie. I cried when she gave me the tickets for my birthday and we queued from early in the morning so that we could get somewhere close to the front. Robbie owned the stage as he always does and we were in awe and amazed. He put on a real show and I felt that it was just for me, for my birthday. 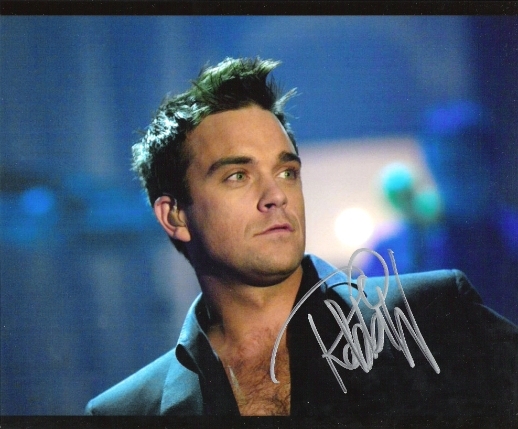 It was just wonderful and sealed my obsession with Robbie. I want my children to enjoy his music, to know all the words to the ballads and miror the moves from his dance tracks. I want them to bounce to Let Me Entertain You and cry as soon as Angels begins. I hope they have No Regrets and are One of God’s Better People. I want my children to listen to Robbie Williams and see him perform even if only on television. What music do you want your children to listen to? I love Dodgy and adore their album Free Peace Sweet from 1996. I had just left school when this was released and bought the CD whilst a Fresher at University. I would listen to this album over and over again. When I met David, he and I would often listen to this in the car over and over again. Singing at the top of our voices, driving fast, windows down, sun on our faces, wind in our hair! That is how I feel about David, it matters not about anything else, as long as we have each other that is all I need. Another song, Homegrown, will be played at Esther and William’s christening next year. Homegrown is the way that it should be – those words fit so perfectly over photos of our gorgeous homegrown babies. These songs just fit us. They mean so much. David and I were supppsed to get married in August 2010 and I wrote to Dodgy who said that they would record Homegrown for us specially for the service. I didn’t remind them and they have never been in touch again but I might send a link to my blog, explain that the wedding postponed and see if they will do something for us this time. It would mean the world to David and I, and be a treasure for the babies to keep. If You’re Thinking of Me is a beautiful, sad song that has gotten me through some sad and lonely times over the years, but now Dodgy reminds me only of my first summer with David and a video he made for me on my birthday that year. Dodgy are easy to listen to, they have simple and meaningful lyrics which tell a story. The melodies are catchy with some of their faster songs being true Brit Pop anthems. This band have grown with me from school through Uni to parenthood. They are a shared favourite with the man I love, we listen to them in the car and In a Room; and I can picture us, in the future, as a family Staying Out for the Summer with Dodgy! When I first participated in this link up from Ghost Writer Mummy I thought it was a one off, now I have realised that it is a weekly link I am very excited and desperate to join in. I begin my contribution with Paul Anka’s ‘Put Your Head on My Shoulder’. This song was a favourite of mine and my sister’s when we were growing up. Our parents always used to play it in the car and we would sing our hearts out in the back seat and act out the actions!!!! Recently at my sister’s wedding we took to the dancefloor, just the two of us, and did the same thing again. It was a wonderful sisterly moment, one of so many, that I will never forget. I hope that Esther and William will have songs and moments like this one and I want to share it with them, my sister and all of you on this day. The music I loved in my own childhood was heavily influenced by my parents. In particular one mix tape that we listened to over and over in the car featuring Buddy Holly, The Everly Brothers, Paul Anka, Neil Sedaka and more … It was badly recorded and over recorded and we knew where all the breaks in the songs came and what song came next. I loved 50s and 60s music as a child and I still do. I definitely want my children to understand the history and significance of rock and roll. As a child of the 80s there was a time I am afraid to say when I loved all things Stock, Aitken and Waterman, especially Kylie. I still do have a secret thing for Kylie and have already introduced my daughter to such classics as Never Too Late and Wouldn’t Change A Thing. Thank you You Tube! Around this time my cousins also introduced me to INXS, Bon Jovi and Aerosmith, alongside Wham! Another branch on my tree of music was born. Many of my dips and dives into different artists and bands have been influenced by Paul and Glen (the cousins) – Wet Wet Wet, AHa! !, George Michael and much much more. As a young teenage I loved James, EMF, The Farm, Happy Mondays, Stone Roses and The Cure amongst others. I also love Madonna and began to get into Rave! At Youth Club I loved Guns n Roses but would equally love dancing to Marky Mark and the Funky Bunch! Oh the memories! As an older teenager my heart was firmly attached to dance music particularly house but also drum and bass whilst frequenting Cream at University! I spent many mispent nights at Cream, Gatecrasher and many other, smaller, better, underground clubs across Europe. I danced right through to my late 20s, until I was 30. During this time I saw The Prodigy and Moby live many times and just LOVED them! Alongside dance though I also loved alternative music particularly Tori Amos, Massive Attack, Primal Scream, Leftfield, Radiohead, The Verve, REM, Ocean Colour Scene, The Levellers, Bjork and there was still an allegiance to rock / grunge – U2, Pearl Jam, Nirvana, Red Hot Chilli Peppers, Alice in Chains, Soundgarden, Faith No More, Foo Fighters. I also liked Def Leppard at some point and Metallica too. And then came Brit Pop – Oasis or Blur – I unashamedly loved BOTH! And I still do! I also love Dodgy. I love Dodgy!! More recently I have fallen in love with The Killers and The White Stripes with thanks to David for these. I could go on and on and on about music and there will always be something or someone that I would have forgotten to mention. Here are some songs though that I would not want my children to miss – in no particular order and again there will be omissions that I will kick myself for later! I can feel a muscial evening coming on very soon. How I love mornings when you wake up to find your CD collection spread out all over the floor where you have been playing song after song in a haze of memory and music. I want my children to have that. I want my children to grab music, embrace it and let it feed their soul, fuel their lives and be the soundtrack to their memories. Music and life go hand in hand and help everyone tell their story. I am sure that music will play a huge part in my children knowing mine.